Ann-Margret (born April 28, 1941) is a five-time Golden Globe Award-winning, Academy Award, Emmy Award and Grammy nominated Swedish actress, singer and dancer. Ann-Margret is currently considered a "single author." If one or more works are by a distinct, homonymous authors, go ahead and split the author. 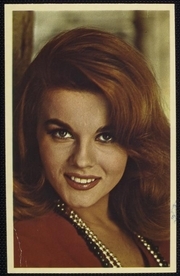 Ann-Margret is composed of 5 names. You can examine and separate out names.